The biggest challenge Michael Phelps, 23, will face in Beijing will be the clock. And not the one at the pool. With all the final races in swimming moving from their traditional evening time slots to refreshing dips first thing in the morning, Phelps' thorniest adversary will be the alarm clock. "I am far, far from being a morning person," he admits. "If I have a workout at 7:30 a.m., I'm hitting the snooze button at 6:50." Still, even the rise-and-shine races, scheduled for prime-time U.S. television, aren't likely to slow Phelps down. In Beijing, he is again on the blocks to swim up to eight events, giving him another chance to surpass Mark Spitz's record of seven gold medals at a single Games. What keeps him so fast in the water? Part of it is technique: he rarely misses a practice, although he may not always be eager to get out of bed for one. Part of it is his remarkable ability to recover quickly from intensive workouts. Hardworking muscles release lactic acid, which causes soreness. 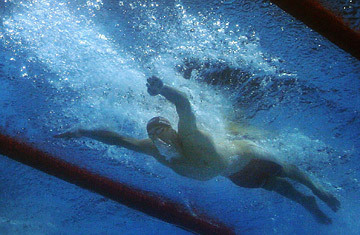 But Phelps' body can flush out lactic acid in minutes vs. the hour or two it takes the bodies of most athletes. Finally, there are the 80-in. wingspan and size-14 feet to propel him through the water. Which means that as long as he wakes up on time, the race for gold could be over early.